How not to look English in an Italian bar! The ritual of drinking coffee at a bar in Italy is so much more than just popping in for refreshment. Once you know what to ask for, your local bar will be your sanctuary, meeting place and home from home. 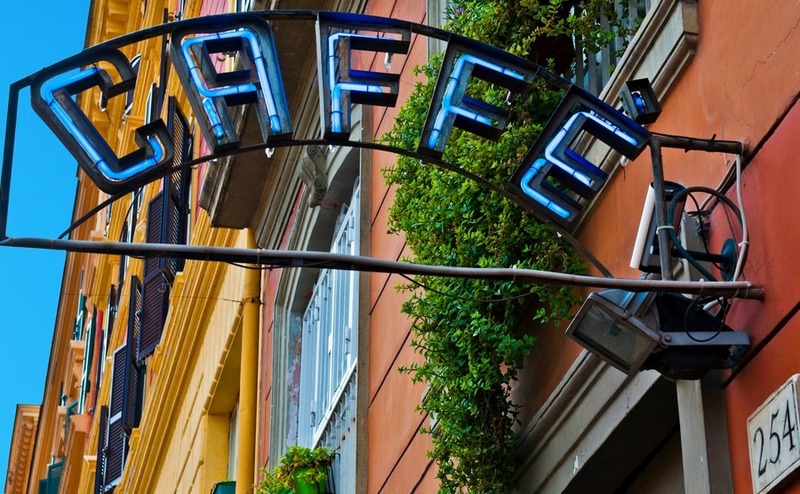 Read our insider’s guide to caffè etiquette. When we go to our local bar on a Saturday morning and are greeted like friends by the barista, it gives us a feeling of belonging and being recognised as being part of the local community. The guy that runs it is from the area and one reason I think the locals go there is to show support for a young local entrepreneur. Coffee in Italy is always served at a temperature ready for drinking straight away. So, don’t complain if it’s not boiling hot. I should point out, that a bar in Italy is not like a pub, it is more like a café. They tend to sell more coffee and water than alcohol. Although people may buy an aperitif before going out for a meal, you will notice that most Italians aren’t drinking alcohol. The bars tend to get busiest in the morning, when people pop in for a quick espresso coffee or a breakfast of cappuccino with a cornetto. But they rarely sit around, they often stand at the bar and have a quick drink and a chat. Coffee in Italy is always served at a temperature ready for drinking straight away. So, don’t complain if it’s not boiling hot. 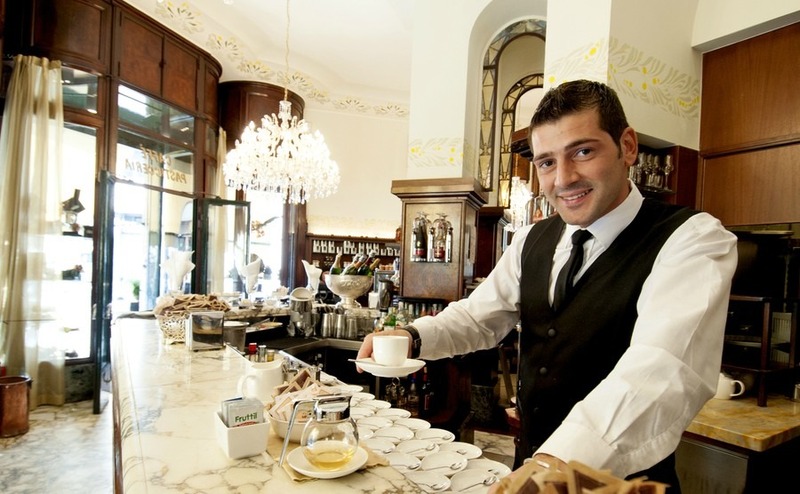 Many Italians drink their coffee at the bar and enjoy the interaction with the barista and anyone else who pops in. Their coffee break may be short, but it’s about sharing the moment and exchanging a few words, before getting back to work. The word “caffè” in Italian means coffee, so Italians just ask for a “caffè” and are given the usual espresso. Anyone who asks for an “espresso” is assumed to be foreign, because what they have actually said is simply “expressed”. The other giveaway that you are British, is if you ask for a “latte” expecting to get a white coffee. What you have actually asked for is milk. If you ask for a “caffè latte” it is likely to be served in a glass and be similar to a cappuccino, but with more coffee and the milk won’t be frothy. It makes me laugh when I go to England and hear people going into Costa and asking for a “latte” with a very posh English “lar” in it. In Italian it’s pronounced “La” like in “lap”. Italians also wouldn’t consider having a milky coffee after lunch and only drink cappuccino for breakfast. To drink milk after a meal is considered bad for your digestion. Why not split the cost and double the fun of holiday homeownership in Italy by buying with family members? Read our new guide, Buying Abroad with Family. There are many coffee variations, and yet when many people are calling out their orders the barista always manages to remember what each person has ordered. That’s a real skill, especially when you consider that most of them don’t write it down or even ring it into the till until you are ready to leave. There are also so many types of coffee they have to remember how to make. Caffè Macchiato: an espresso with a drop of milk. Caffè Schiumato: with only a foamy drop of the milk added. Caffè Corretto: coffee with a shot of liquor. Most bars I have been into don’t expect you to pay until you are ready to leave. So, it is up to you to remember to do so. In very busy bars in tourist areas, shopping centres, airports etc. you may be expected to order and pay at the till first and then put your receipt on the bar for the barista to see. Be careful in top tourist spots as the cost to sit down and be served at the table may be considerably higher than if you stand at the bar. Ask if there is a seating charge. In your average local bar a coffee should only cost about €1.20. If you have a cappuccino, a pastry or cornetto (croissant) usually costs about the same. What else can be bought at the bar? As well as coffee and aperitifs, more and more bars are offering a selection of fruit and herbal teas. Camomile tea is the most popular in the evenings. Don’t expect to be able to get an English tea with milk though. The thought of a mug of hot water with milk, is something totally alien to Italians. The nearest they might have is a box of Earl Grey or English Breakfast tea. So, if you really can’t do without your Typhoo or Tetleys, I recommend packing plenty of boxes to bring with you from the UK. A favourite drink in the winter is “cioccolata calda”, a deliciously thick hot chocolate drink. My local café has also begun stocking healthy gluten and lactose-free hot drinks. Then, in the summer the Granita machines start turning and the juicer is put into action making freshly squeezed juices. At breakfast time, bars will have a glass cabinet displaying cornettos, biscuits, cakes and frankfurter sausage rolls. At lunch and dinner times there may also be a selection of snacks, panini, and light meals. In the summer they also sell Gelato. Life in Italy revolves around the bars and piazzas. Coffee is what keeps the wheels turning and the friendly exchanges of greetings at the bar create a strong sense of community.